Having analysed close to a dozen immersive sims in my scripts, there is a set of RPG quest tropes that returns in most of them. The best way to illustrate that is through a comprehensive example, so I will take the UNATCO base in the first Deus Ex, my favourite of the genre. 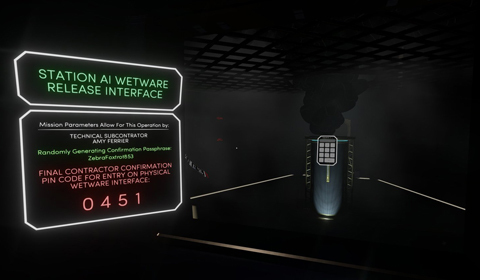 When you enter the base, you can talk to people and listen in on conversations, access computers and read mails, and take in environmental cues, all to construct a backstory in your head. This type of storytelling is used in many immersive sims and starts to show an obvious artifice when repeatedly encountered. For instance, conversations only occur when you approach and trigger them. Nobody in the UNATCO base is speaking amongst themselves until you are around to eavesdrop and potentially become involved. Computers will only list a maximum of three to five mails, which all have at least some relevance to you. It starts to feel bespoke, like it's play-acting for your benefit. This can be masked with good writing, but it's still fairly transparent when a piece of dialogue is only meant to give you an objective or a keycode, which makes the proceedings feel like they revolve around you, the protagonist. Tacoma recontextualises this with its augmented reality recording system and how that central conceit gives you complete control over the action while simultaneously removing you as the centre of it. There's even a sly dig at expository graffiti, a hokey trope that returns in a lot of immersive sims. The corporation that owns Tacoma station logs every facet of its employee's lives through 3D recordings, which you can access through a playback system. These recordings serve as elaborate audio logs and manifest as "ghosts" that bring to mind the residual psychic emanations in System Shock 2 or the ADAM-related apparitions in BioShock. 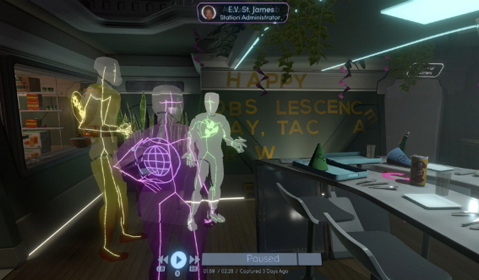 Observing their ghosts is how the backstory of Tacoma's crew of six is reconstructed, but it's no longer dependent on proximity triggers. You basically get a remote control for the action, allowing you to pause and rewind the recordings at will. This proves necessary when you realise that, unlike in the UNATCO base, multiple concurrent conversations can take place in different parts of the station. Crewmembers can peel off from the group and carry on private chats, which means you have to move around and rewind to catch the full picture. At certain moments in these recordings, crewmembers can briefly open up their AR desktops to check something. You can recover these desktops, but they will only display the specific files that the crewmember was accessing in that moment. This neatly excuses why you can't ever browse someone's entire hard drive beyond the game development consideration that it would be incredibly daunting to map all of that out and then expect you to go through all of it. 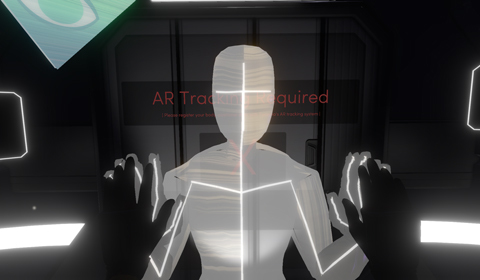 The game's overall writing is of a high quality on its own, but the consolidated AR recording system lends the group dynamic of the Tacoma crew a very naturalistic feel, precisely because none of them are or ever were aware of you, the player. Nothing they say or write is meant to make you feel like the centre of attention. You are entirely inconsequential to the crewmembers, putting the onus squarely on them. You are not the protagonist, you are watching an ensemble cast. Immersive sims like to boast "a world that lives and breathes independent of the player's actions," but in its own way, Tacoma feels like the first one that truly fulfils that potential. The AR system assigns the Tacoma crew vibrant colours, but you get a bland grey.